Biologist and former Army soldier Lena (Natalie Portman) finds herself thrust into a government coverup and investigation of an alien phenomenon. It would seem a shimmering “thing” is spreading out over the woods and coastline in a semi remote part of the country; inside that region the laws of nature somehow seem to be warped, re-written, and re-born. Now on a personal quest, Lena, and a team of other scientists including psychologist Dr. Ventress (Jennifer Jason Leigh) and physicist Josie Radek (Tessa Thompson) set out into the shimmer to reach its point of origin and investigate further, hopefully explaining the disappearance of all else who have entered. Written and Directed by Alex Garland, based on the novel by Jeff VanderMeer, this delve into the prismatic world of the unknown is a further solidification of Garland as one of the new greats of Sci-Fi. Carefully crafting plausibility via elements of religion, psychology, sociology and science, the feasibility of what transpires in Annihilation seems completely within reason and Garland successfully plants the seed of “what if?” this time to flourish into a beautiful nightmare, a truly inspired and inspiring take on a genre that often angles to the cheap and easy way out. Meanwhile, the ensemble, which also includes Oscar Isaac, Tuva Novotny, and Gina Rodriguez successfully sell the dream of this ornate illusion with just enough answers to keep us, the viewer, on the hook up to the bitter end, only to be filled with a thousand more questions with room for discussion. A think piece to keep you on edge, Annihilation is rated R.
Max and Annie (Jason Bateman and Rachel McAdams) are a highly competitive but loving couple, so when successful and older brother, Brooks (Kyle Chandler), invites them over for a special Game Night at his abode the duo is out to win all the marbles, so to speak. For funsies the evening’s game happens to be a live action kidnap drama, whodunit. Trouble is, the live action is real, and Max and Annie find themselves caught up in a real life kidnaping mystery, solving the plot will require their wit, wisdom, a bit of dumb luck, and their friends. Can they win this one? For the Gipper, maybe? Directed by John Francis Daley and Jonathan Goldstein and Written by Mark Perez this goofy romp sets up a few good laughs and equally chair squirming winces to make for a flash round of cinematic escapism. And, while the overall plot isn’t terribly advanced, and humor points don’t create the laugh riot it could be, the charm is still there, the heartbeat is well enough to let this baby roam free. Furthermore, Bateman and McAdams on screen chemistry is infectious and the rest of the ensemble including Billy Magnussen, Lamorne Morris, Kylie Bunburry, Sharon Horgan, and Jesse Plemons make for equally awkward and enjoyable interplay, one could say they’re great fellow contestants in the game. 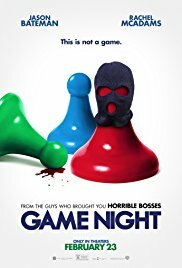 A fun distraction if you’ve already exhausted all of your Oscar watch list, Game Night is rated R.
Centuries ago the middle of the African continent was struck by a meteor containing a rare material known as vibranium; since then the tribes living the region/nation known as Wakanda have learned to harness its powers, advancing their technological and educational prowess to levels not seen anywhere else in the world, all the while keeping vibranium and its powers a closely guarded secret. Coupling vibranium with royalty the story picks up with the death of the Wakandan King and the re-crowning of its Prince T’Challa (Chadwick Boseman). As the new king of Wakanda T’Challa will also serve as the Black Panther, the guardian/protector of the nation as well as its diplomat. Challenged by the growing threat of stollen vibranium the Black Panther will have to put an end to the arms dealer Ulysses Klaue (Andy Serkis), but an even bigger threat to Wakanda and its secrecy is knocking just outside the door as a potential heir to the throne returns home. 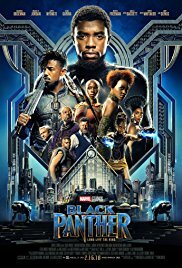 Directed by Ryan Coogler this ambitious film sets out to accomplish many tasks within the Marvel Cinematic Universe without touching anything fans are already familiar with, from establishing an origin story, revealing the world of Wakanda its technology and it’s tribal makeup, the establishment of several villains, further inner strife within the Wakandan tribes and their political leanings and beliefs, a growing romance, and, the peacemaking required all round, it’s a hefty ask to say the least. Yet, dotted with a ridiculously talented ensemble including Michael B. Jordan, Lupita Nyong’o, Daniel Kaluuya, Angela Bassett, Forest Whitaker, Danai Gurira, and Letitia Wright, the cast seems up for the challenge. Perhaps the bigger challenge is maintaining forward momentum in what threatens to become a formulaic Marvel hero’s quest storyline lulling at several yawn inducing points. Albeit, the empowered treatment of educated women warriors in this film makes a powerful statement in the face of our present day politics and the overall message of the film is positivity in the face of adversity, also re-freshing. Bottom line, despite its flaws, there’s still plenty to embrace and the fortified strength in the diversity column is a much welcomed addition to the MCU. Black Panther is rated PG-13.